In 1942 Detroit, as WWII heats up, a maniac/patriot stalks hoarders, slackers, and anyone else he thinks stands in the path of allied victory. He wears a spurious air corps uniform, and a stolen bayonet is his weapon of choice. Already five malefactors have been convicted (and executed) by this self-appointed, one-person kangaroo court. Trying desperately to catch up with him is Lieutenant Zagreb, heading a cobbled-together police force of service rejects and near-pensioners. But a flag-waving sociopath isn’t all Zagreb has to contend with. 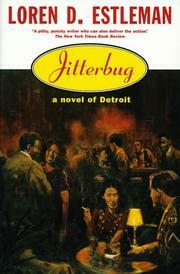 Detroit is a racial powder keg waiting for its match, and Zagreb knows explosion is inevitable. Up from the south has come a steady stream of the manpower needed to convert America to fighting readiness. Young black men work next to young white men, equal and no longer separate. The night that goes up in flames is also the night an old woman recognizes a photograph, and Zagreb gets the break in the case he’s been longing for. A desperate car chase ensues, followed by a bloody shoot-out, while in the streets black kids and white kids beat each other up as if no other war could possibly matter as much. Colorful characters, swift, uncluttered narrative, and some of the best dialogue crime fiction ever gets to feature. This is Estleman, the master storyteller (The Witchfinder, p. 304, plus 40 more), making the others in his guild look like apprentices.